Atelier Naoko is a culture school for foreigners that's located in Tsukishima, an island in Tokyo Bay filled with cool alleys, near the Tsukiji Fish Market and Ginza. 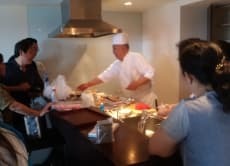 We have several unique classes like a Tsukiji Fish Market tour with a sushi chef, sushi making class, karate, calligraphy, and a Japanese-style home party. You can also make presents of preserved flowers or origami. Since most classes are held in an ordinary house (that of Atelier Naoko), you can learn about Japanese culture in a comfortable atmosphere with a nice view of the Sumida River. English and French services are available.